EarthQuaker Devices Fuzz Master General Review - Best "SuperFuzz" Pedal? I have to admit that I’m a huge fuzz nerd, having built a bunch of different circuits myself, and I consider fuzz an incredibly musical and inspiring type of effect. So I was obviously quite excited when I got my hands on the EarthQuaker Devices Fuzz Master General, especially considering that EQD has a lot of experience when it comes to modernizing classic circuits as well as having released a wealth of unique sounding and original designs including the Bit Commander, Afterneath, Rainbow Machine, Disaster Transport SR, and Palisades pedals to name a few. In a nutshell, the Fuzz Master General is a revamp of the ”Ace Tone Fuzz Master FM-2 Professional” which was fairly similar to the more widely known “Univox Super Fuzz”. The design is quite different from the better known 60’s fuzzes (Tone Benders and Fuzz Faces), and while the resulting sound might take a little getting used to, it can be very musical once you get the hang of it. There are a few original specimens out there in the realm of fuzz pedals, but coming across one for a reasonable price is often a rare occasion. I’m glad the current climate in the boutique pedal market gives companies the freedom to “reissue” relatively obscure circuits like these. The original Ace Tone FM-2 was made in Japan between roughly 1968 and 1971, by Ace Electronic Industries Inc., a company started by Ikutaro Kakehashi, who later founded Roland. So even though it’s a fairly obscure fuzz, its creator has been responsible for some of the most common designs around, in other words, someone who definitely knew what he was doing. It must also be noted that the 1960’s and 70’s were a very productive and innovative period for the musical instruments business in Japan, as they were putting out a lot of designs. Close cousins to the FM-2 besides the Univox Super Fuzz would be the Ibanez Standard Fuzz, The Roland Bee Baa, and the Companion Fuzz by Shin-Ei (who also brought us the Uni-Vibe). The Fuzz Master General stays true to the original circuit but adds a couple of ‘updates’ to make this guitar pedal a little better suited to today’s players. Mode 1 – A pair of Germanium clipping diodes, supposedly produces a more “open and looser fuzz”. I believe this is the original configuration. Mode 2 – Silicon clipping diodes. This produces a tighter, more compressed fuzz. Mode 3 – Bypasses the diodes altogether, generating all the fuzz generated by the transistors only. Another obvious upgrade was replacing the ‘tone selector’ switch, which went between two radically different settings (mid-boost and mid-scoop), by inserting a pot in its place, making the unit a lot more flexible. The other less exciting, yet essential, upgrades include a very bright white LED and a DC jack (in addition to a battery snap) located on the top of the pedal, next to the input and output jacks. Of course, it’s also true bypass, although this surprisingly enough isn’t technically an ‘upgrade’ since the originals were TB as well, a relatively rare feature back then. Also noteworthy are the cool graphics featuring two knight helmets in an attractive blue/green, fairly scratch resistant finish. This will help the FM-2 still look pretty decent after it’s lived on your pedalboard for a while. Taking a look on the inside, the first thing I noticed is the meticulous build quality, and although it uses smaller than usual resistors in order to save some space, it is still clearly hand-built. The silicon transistors in the original FM-2 were 2sc369’s from what I’ve read, but the Fuzz Master General uses 2n5089’s, a readily available modern replacement. Since it’s a more involved circuit (which besides transistor clipping also includes diode clipping), transistor types matter less than in a Fuzz Face for example, and a lot of transistors are known to sound faithful in this circuit. 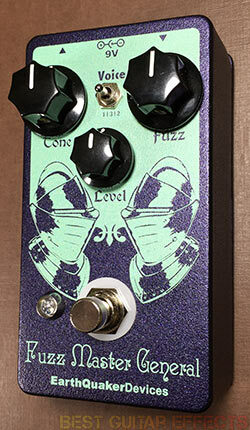 Visit EarthQuaker Devices for more info about the Fuzz Master General. Although I unfortunately have no experience with the original Ace Tone FM-2, the Fuzz Master General certainly does deliver as I expected as there are lots of wild and filthy fuzz tones (and relatively little subtlety) to be found in this pedal. The fuzz sounds range from velcro style fuzz with little sustain to thick and saturated, although the metallic robotic quality of the ring modulation shines through at most settings. Although most guitarists would run it at or near maximum most of the time, there are good tones to be had across the entire range of the fuzz control, obviously also depending on the guitar’s pickups. Since the Fuzz Master General is fairly gated, there isn’t a lot of noise or hiss, but this also means it doesn’t really clean up much when rolling back the volume. Of course it’s not really the type of fuzz for that anyway. The Tone control works opposite of most tone knobs, with the tone getting darker as you turn it clockwise. And it’s not just the highs that get attenuated but also the mids, going from a buzzy sound all the way to a heavily scooped tone at maximum. The Level control adjusts the output volume, and can be used to slam the amp quite a bit harder, but it’s also meant to compensate for the difference in volume between the different diode clipping options and tone control settings. When flipping through the various diode clipping options, the first thing that becomes apparent is the huge volume boost on the ‘diode bypass’ setting; however, its cleaner sound and more pronounced upper octave are a very welcome addition to the two relatively similar diode types. Germanium clipping is supposed to sound a bit woolier, and I did indeed detect a subtle change in the low end response compared to the silicon setting. Single-coil and humbucker equipped guitars both work well with humbuckers resulting in a more compressed fuzz, but single coils still sounded plenty fat and sustained nicely. On more extreme Fuzz settings, playing anything more than a power chord, especially in the lower registers, results in an angry robotic ring-mod-esque growl, which can be interesting for more chaotic styles of riffing. But when playing leads the pedal really shines. When moving to the area around the 12th fret, the octave-up sound becomes quite apparent (particularly if you’re using your guitar’s neck pickup) although maybe not as clear as an Octavia or a dedicated octave effect. But it’s still a lot clearer than my Fender Blender for example. For me, the musicality of this type of fuzz sound lies in it’s unpredictability and being forced to change your playing to get the fuzz to respond the right way. 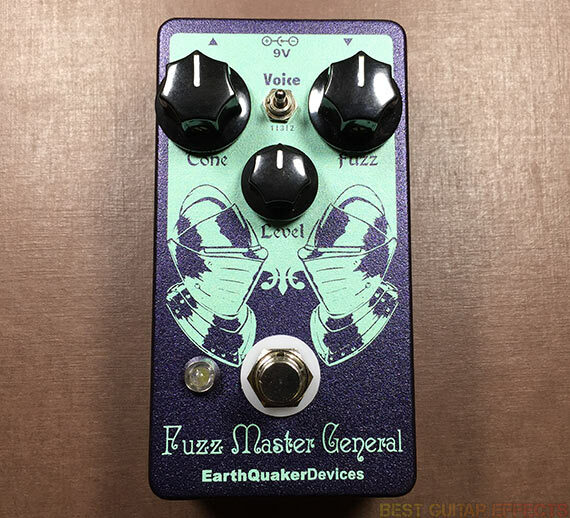 Like with most other fuzzes I preferred the Fuzz Master General into a slightly overdriven amplifier as it rounds off the edges a little bit, allowing you to subtly go between more traditional overdriven sounds to over the top fuzz when engaging the pedal. As an alternative to a overdriven amp, an overdrive pedal can do the trick as well. For example my Catalinbread SFT (which is meant to emulate a 70’s Ampeg SVT amplifier) sounded great in combination with the Fuzz Master General when going for a Queens of the Stone Age inspired sound. If you’re going for very ‘in your face’ and angry sounds, however, plugging into a clean amp or even going direct can yield great results as well. The EarthQuaker Devices Fuzz Master General is a highly musical and inspiring addition to any fuzz lover’s arsenal. There’s only a mild learning curve involved in regards to the Tone knob and diode settings to achieve preferred results as well as adapting your playing style to make effective use of the octave up and ring modulation sounds. And admittedly, the style of fuzz is an acquired taste and certainly not for the faint of heart. But the Fuzz Master General is surprisingly quiet and easy to live with, and plugging it into the right amp definitely made me want to crank up and jam which is what a great pedal is supposed to do. It’s definitely worth considering if you’re looking for a quality “Super Fuzz” style of fuzz pedal. 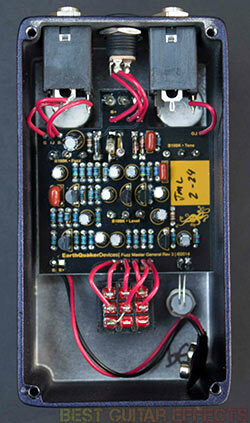 That concludes our EarthQuaker Devices Fuzz Master General review. Thanks for reading. 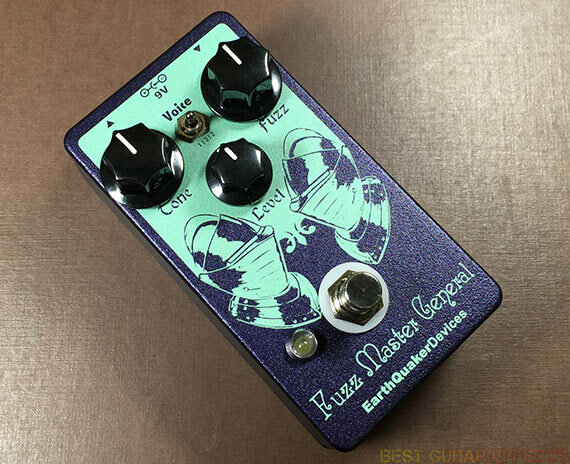 Want to buy the EarthQuaker Devices Fuzz Master General? 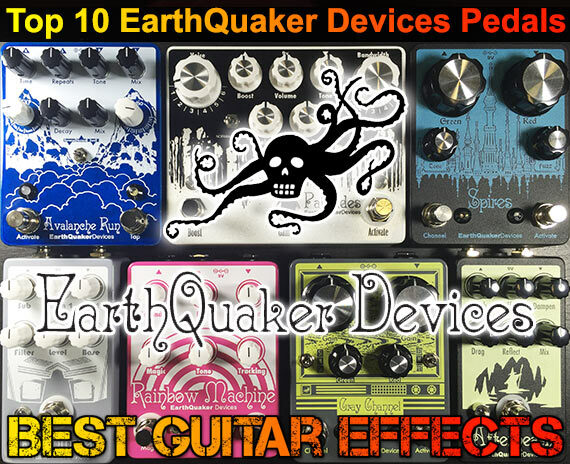 And check out our list of the best EarthQuaker Devices pedals!